When you have a sinus infection, what you want most is instant relief. According to WebMD, some of the symptoms of a sinus infection are pressure behind the eyes and or cheeks, fever, cough, bad breath, worsening headache, fatigue, decreased sense of smell, postnasal drip, and just a general feeling like crud. 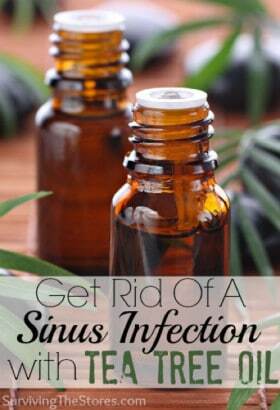 If you have these symptoms and want to try a natural home remedy for sinus infection, Rachael at Surviving The Stores has a solution for you. She shares her natural remedy using tea tree oil. Try it and let us know if it works for you!